You may know what foods contain protein, but have you ever wondered what protein actually is – and why you need to eat it every day? Protein is, of course, a vital component of a healthy diet. Most of us have known this since we were kids – probably from being told that protein would make us “big and strong”. And, while there’s some debate as to who actually created the word “protein” (it first appeared in the scientific literature in 1838), there’s no disagreement that it was derived from the Greek word “protos” – meaning “first rank or position” – in recognition of how important protein is to life. The proteins you eat (and the proteins in your body) are all made up of small units, called amino acids. You often hear amino acids described as “building blocks” because these small individual units are assembled in various ways to build proteins. It may help to think of amino acids in the same way as letters of the alphabet. In English, we use just 26 letters to make up all of the words that we write and speak. Some words are short, some are long – but we create millions of words from just 26 letters. And, the final sequence of the letters is what gives each word its sound, and its meaning. Similarly, there are 20 amino acids that can be strung together to make proteins – the ones you eat, and the ones that are made by your body. And just as we don’t use all 26 letters to make every word, most proteins don’t contain all 20 amino acids, either. But – just as letters are strung together to make words – amino acids can be strung together in different sequences and in different lengths (from just a few amino acids to several thousand) to make different proteins. And, the sequence of amino acids gives each protein its “meaning” – because the final structure of the amino acid chain determines specifically what that protein is, and what it does. The Proteins You Eat Maybe you never thought about it, but not all food proteins are the same. The sequence of amino acids that creates the white of an egg is much different from the arrangement of amino acids that creates the protein in a glass of milk. When you eat foods that provide protein, then, it should make sense that different foods contain different proteins (and usually more than one) – even though they’re all made up of amino acids. For example, when you eat milk or yogurt, you’re eating proteins called casein and whey. When you eat meat or fish or poultry, you would be eating – among others – proteins called collagen and myosin. Beans have proteins called legumins, and eggs contain a number of different proteins, including one called avidin and one called ovalbumin. Each of these proteins is unique because each is made up of a unique sequence of amino acids. And once the proteins are digested and absorbed, their amino acids can then be used as building blocks for the proteins within your body. As protein foods travel through the digestive tract, they’re ultimately broken back down into their individual amino acids, which are absorbed into the bloodstream. Your body can then use these building blocks to manufacture some 50,000 different body proteins – each of which has a specific structure (and function) based upon its arrangement of amino acids. As long as your body has all the necessary “raw materials” in the form of the amino acid building blocks, it can manufacture these important body proteins – from the enzymes that speed up chemical reactions in the body, to hormones that act as chemical messengers. (Other proteins support your immune function, or transport nutrients in your body – and of course, you have proteins that provide structure to your bones, skin, hair, nails and muscle, too). Once the amino acids enter your bloodstream, there’s no way to tell whether they were derived from a bowl of lentils or a steak; they all end up as an amino acid “pool” in your body’s tissues and fluids – a pool that can be tapped into as needed. To ensure a steady supply, though, it’s important to consume adequate protein every day. Eating the right amount – and the right types – of protein every day is important for a couple of reasons. For one thing, if you consistently had a shortage of protein in your diet, your body would have no choice but to start breaking down proteins within your body to provide the amino acids needed to produce the most vital body proteins. The types of protein you eat matter, too. Of the 20 amino acids that your body uses to manufacture body proteins, nine of them are called “essential” – they have to come from your diet because your body cannot make them (although it can manufacture the remaining 11 amino acids). 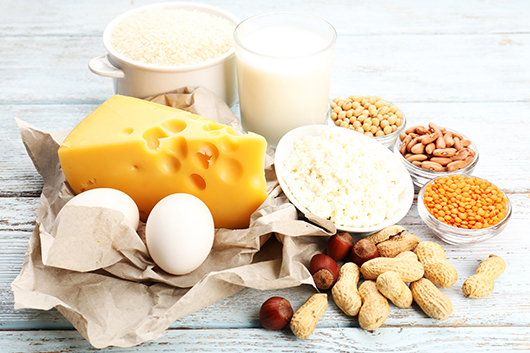 Proteins that come from animal sources – meats, fish, poultry, eggs, milk and milk products – contain all of the essential amino acids, so they’re referred to as “complete” proteins. Plant proteins are found in foods like beans, lentils, nuts and whole grains and – with the exception of soybeans (and protein foods derived from soy such as tofu, tempeh, soy milk or soy protein powders) – plant proteins are lacking one or more essential amino acids, so they’re considered “incomplete”. Strict vegetarians work around this by consuming a wide variety of foods to ensure that they get their full complement of essential amino acids in their diet. Susan Bowerman, M.S., R.D., C.S.S.D., F.A.N.D. – Director, Worldwide Nutrition Trainingat Herbalife. Susan is a Registered Dietitian and a Board-Certified Specialist in Sports Dietetics.